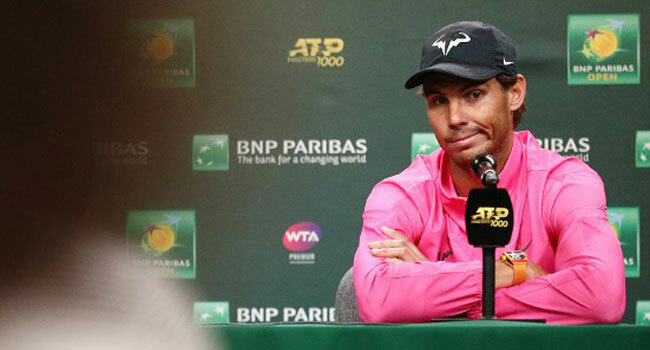 : Rafael Nadal of Spain speaks to members of the media after withdrawing from his men’s singles semifinal match against Roger Federer of Switzerland due to a right knee injury on Day 13 of the BNP Paribas Open at the Indian Wells Tennis Garden on March 16, 2019 in Indian Wells, California. World number two Rafael Nadal pulled out of his Indian Wells semi-final against old foe Roger Federer on Saturday with a right knee injury. The Spanish superstar, who has battled knee tendinitis and other injuries throughout his career, made it through a 7-6 (7/2), 7-6 (7/2) win over Karen Khachanov in the quarter-finals on Friday. H received treatment and supportive tape on the knee during the match and said Saturday morning he wouldn’t be able to take the court for what would have been his 39th meeting with Federer.